When the vows have been said and your beloved wedding guests have gone to the reception hall to await your official arrival as man and wife, why not give them something to keep them out of trouble or worse yet, from getting bored? Our Fantastic Friday Wedding Blog has just the thing, PHOTO BOOTHS! There’s nothing like hot pink boas, oversized glasses, Viking hats and a camera to keep human beings entertained for hours. We snapped up an interview with Snap Me Crazy Photo Booth owner Dave Tamez about the ins and outs of his business and why you need a booth at your next wedding or event. OKBride: How long have you been in business and why did you start? Dave: We started Snap Me Crazy Photo Booths over 5 years ago. I have been shooting television news videography and doing still photography work for over 30 years. The photo booth business was just starting to gain attraction, and there was a need in this market. Therefore, when my son asked me if I would like to invest in a business, the photo booth business was a very natural progression. OKBride: What types of events do you do? Dave: We specialize in providing photo booth photography for weddings, but our services also include birthday parties, proms, church and school events, anniversary and retirement parties, festivals, corporate events, proms, class reunions, and anything you can think of celebrating! OKBride: What’s your favorite type of event and why? Dave: The majority of our photo booth business comes from weddings. We feel honored and privileged that our wedding clients would allow and trust us to be a part of their special day. The wedding couples have enough to worry about, so knowing that we are providing a service that will entertain their wedding guests as well as capture some amazing photos, makes our job very satisfying. Photo booths have become a staple for weddings and usually are one of the highlights of a wedding reception. OKBride: Why should couples consider having a photo booth at their wedding? Dave: We know weddings include many expenses. Of course, we are a little bias, but if you can budget a photo booth into your wedding plans, please do so! You will not be disappointed because along with the dancing, photo booths have become the highlight at weddings. While you are doing other things required at wedding receptions, we will entertain your wedding guests and provide them and you with memorable keepsakes of your special day! Here are some highlights from our recent blog post of our top 5 reasons you need a photo booth for your wedding. 1) TO CAPTURE MEMORIES A photo booth provides a fun and comfortable atmosphere designed to capture authentic and memorable moments. You won’t regret renting a photo booth when you see your grandma wearing a pink boa, crazy glasses, and a sailor’s hat. Your wedding photo booth will be unforgettable and will provide memories that will last a lifetime! 2) FOR THE EXPERIENCE AND ENTERTAINMENT Your wedding is about you, but while you’re busy taking pictures and mingling, why not offer your guests some fun too? A photo booth is guaranteed to be one of the highlights of your wedding because it is something everyone can be a part of as well. 3) FOR THE WEDDING SCRAPBOOK The scrapbook is the favorite part of the photo booth experience for many couples. A copy of every photo strip that’s taken in the booth is pasted in the scrapbook, and your guests are encouraged to write personal notes to you and your significant other. A wedding scrapbook can also be used as a guestbook, which saves you money! 4) FOR THE HIGH-QUALITY STRIPS AND PHOTOS Photo booths are likely to have professional cameras and high-quality printers that result in amazing images. A photo booth is a wonderful way to make sure everyone gets a great looking photo during your wedding reception. Tip: Be sure to find out if your photo booth rental company is using a professional camera and NOT a webcam!!! 5) FOR THE SOCIAL VALUE Photo booths bring people together and are friendly conversation starters. Photo booths will get your guests talking and keep your guests engaged throughout your wedding reception! OKBride: Is there any photo booth etiquette we should know about? Dave: We want everyone to have a good time getting propped up and getting their pic snapped in our booth! The only thing we ask is to allow the people in front of the line to get access to their props first, so they have a wide selection to choose from. Also, it is okay to take your own selfies with your phones using our props, but remember to please put them back for others to use. 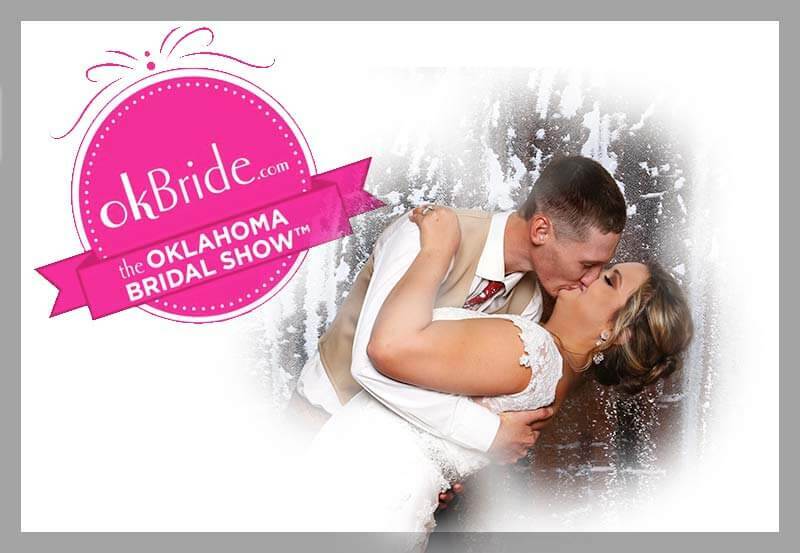 OKBride: What sets Snap Me Crazy apart from other photo booths? Dave: Our photo booth pros are trained in photography and know how to adjust our DSLR cameras to ensure the best photos possible! Plus, all of our photo booths are equipped with professional cameras, professional lighting, and have lab-quality printers that can print in seconds! Our photo booths are the best in the market and offer a tremendous difference in the picture clarity, color, and overall photo quality! Snap Me Crazy Photo Booth operates four photo booths and books between eight to 15 events per month, so the earlier you book, the better. Packages range from $699.00 to $799.00 and all wedding packages include a wedding scrapbook.